Changing the filter on a fuel-injected vehicle can be tricky. 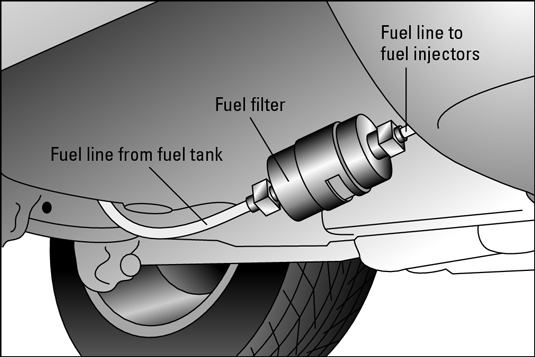 On fuel-injected vehicles, you need to disable the fuel pump to relieve the pressure on the fuel lines, which may be secured to the filter with clamps, threaded fittings, or special quick-connect fittings. Lines with threaded fittings require a special flare-nut line wrench. Lines with special quick-connect fittings may require special tools to disconnect them. Ask the clerk at an auto parts store or the service department at your dealership which type of filter your vehicle has. A fuel filter located under the vehicle near the fuel tank. A fuel filter in the fuel line under the hood. Some vehicles also have a fuel filter in the fuel pump as well as a filter screen inside the fuel tank. If they get blocked up, only a professional should deal with them. Here are step-by-step instructions for changing a fuel filter. Before you get started, read them carefully and make sure that you want to do this job yourself. Relieve the pressure in the fuel line before disconnecting it. To do so, you have to disable the electric fuel pump before you start the engine. Make sure that the parking brake is on and that the vehicle is in Park or Neutral, and then start the engine. It won’t run very long after you start it up, but the pressure in the fuel lines will be reduced. Turn off the engine. 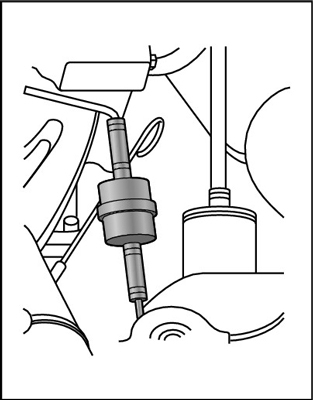 With the fuel pump disabled, you’re ready to disconnect the fuel lines from the filter. Look at the old filter and the new one before disconnecting anything. You should see an arrow stamped on both filters that shows in which direction the fuel flows through it. If the new one doesn’t have an arrow on it, look to see in what direction the old filter is installed so that you can tell which end of the new filter goes where. Remove whatever is holding the old filter in place and remove it. Put the new filter on in the same position as the old filter. Replace whatever holds the filter in place, and make sure it’s secure. Replace the fuse for the fuel pump in the fuse box. Make sure that the parking brake is on and that the vehicle is in Park or Neutral, and then start the engine and check for leaks around the filter.